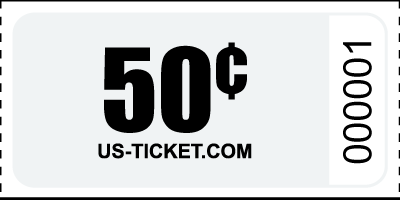 Our $0.50 Roll Tickets ( 50 cent roll tickets )are printed on bright white ticket stock and are available in lots of colors. This provides a unique look that your guests or customers will not find at the local party store ! Each 1" by 2" ticket is sequentially numbered within rolls of 1000 tickets. Just like all of the tickets at US-TICKET.COM these can be customized in any way you like !